The world's tallest artificial structure is the 829.8-metre-tall (2,722 ft) Burj Khalifa in Dubai (of the United Arab Emirates). The building gained the official title of "tallest building in the world" and the tallest self-supported structure at its opening on January 9, 2010. The second-tallest self-supporting structure and the tallest tower in the world is the Tokyo Skytree. The tallest guyed structure is the KVLY-TV mast. The Council on Tall Buildings and Urban Habitat, an organization that certifies buildings as the "World's Tallest", recognizes a building only if at least 50% of its height is made up of floor plates containing habitable floor area. Structures that do not meet this criterion, such as the CN Tower, are defined as "towers". There are dozens of radio and television broadcasting towers which measure over 600 metres (about 2,000 ft) in height, and only the tallest are recorded in publicly available information sources. whether structures built in and rising above water should have their below-water height included in any assessment. whether a structure, building or tower that is guyed is assessed in the same category as self-supporting structures. whether a floor built at a high level of a telecommunications or viewing tower should change the tower's definition to that of a "building"
The CN Tower in Toronto, Ontario, Canada, was the world's tallest freestanding structure from 1975 to 2007. This category does not require the structure to be "officially" open but does require it to be "topped out". 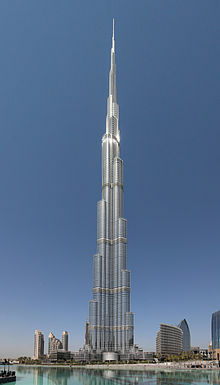 The tallest artificial structure is Burj Khalifa, a skyscraper in Dubai that reached 829.8 m (2,722 ft) in height on January 17, 2009. By April 8, 2008 it had been built higher than the KVLY-TV mast in North Dakota, USA. That September it officially surpassed Poland's 646.38 m (2,120.7 ft) Warsaw radio mast, which stood from 1974 to 1991, to become the tallest structure ever built. Guyed lattice towers such as these masts had held the world height record since 1954. The Petronius Platform stands 610 m (2,000 ft) off the sea floor leading some, including Guinness World Records 2007, to claim it as the tallest freestanding structure in the world. However, it is debated whether underwater height should be counted, in the same manner as height below ground is ignored on buildings. The Troll A platform is 472 m (1,549 ft), without any part of that height being supported by wires. The tension-leg type of oil platform has even greater below-water heights with several examples more than 1,000 m (3,300 ft) deep. However, these platforms are not considered constant structures as the vast majority of their height is made up of the length of the tendons attaching the floating platforms to the sea floor. Despite this, Guinness World Records 2009 listed the Ursa tension leg platform as the tallest structure in the world with a total height of 1,306 m (4,285 ft). The Magnolia Tension-leg Platform in the Gulf of Mexico is even taller with a total height of 1,432 m (4,698 ft). Taipei 101 in Taipei, Taiwan, set records in three of the four skyscraper categories at the time it opened in 2004; at the time the Burj Khalifa opened in 2010 it remained the world's tallest inhabited building 509.2 m (1,671 ft) as measured to its architectural height (spire). The height of its roof 449.2 m (1,474 ft) and highest occupied floor 439.2 m (1,441 ft) had been surpassed by the Shanghai World Financial Center with corresponding heights of 487 and 474 m (1,598 and 1,555 ft). Willis Tower (formerly Sears Tower) was the highest in the final category: the greatest height to top of antenna of any building in the world at 527 m (1,729 ft). Burj Khalifa broke the height record in all four categories for completed buildings. Note: The following table is a list of the tallest completed structure in each of the structural categories below. For a list of structures by function see the list later in the article. There can only be one structure in each category, unless the tallest is the same for more than one structure in the same category. There are some destroyed architectural structures which were taller than the tallest existing structure of their type. There are also destroyed structures omitted from this list that had been surpassed in height prior to being destroyed. Gasometer Gasometer Zeche Nordstern Germany Gelsenkirchen 147 482 Completed in 1938, damaged at an air raid on May 13, 1940 in such a manner, that it was not usable any more and had to be demolished. * "Mixed-use" is defined as having three or more real estate uses (such as retail, office, hotel, etc.) that are physically and functionally integrated in a single property and are mutually supporting. Up until the late 1990s, the definition of “tallest building” was not altogether clear. It was generally understood to be the height of the building to the top of its architectural elements including spires, but not including "temporary" structures (such as antennas or flagpoles), which could be added or changed relatively easily without requiring major changes to the building's design. Other criteria for height measurement generally were not considered, which occasionally caused some controversy. One historic case involved the building now famous for the Times Square Ball. Known as One Times Square (at 1475 Broadway in Midtown Manhattan), it was the headquarters for The New York Times, which gave Times Square its name. Completed in 1905, it reached a height of 364 feet (111 meters) to its roof, or 420 feet (130 meters) including its rooftop flagpole, which the Times vainly hoped would give it a record high status. But because a flagpole is not an integral architectural part of a building, One Times Square was not generally considered to be taller than the 390-foot-high (120 m) Park Row Building in Lower Manhattan, which was therefore still New York's tallest. A bigger controversy was the rivalry between two New York skyscrapers built in the Roaring Twenties — the Chrysler Building and the Bank of Manhattan Trust Building, now called the Trump Building but better known as 40 Wall Street (thus avoiding confusion with the many other Trump-named buildings). The latter was 927 feet (283 meters) tall, had a shorter pinnacle, and had a much higher top occupied floor (the second category in the 1996 criteria for tallest building). In contrast, the Chrysler Building employed a very long 125-foot (38 m) spire secretly assembled inside the building to claim the title of world's tallest building with a total height of 1,048 feet (319 m), despite having a lower top occupied floor and a shorter height when both buildings' spires are not counted in their heights. Although the architects of record for 40 Wall were H. Craig Severance and Yasuo Matsui, the firm of Shreve & Lamb (who also designed the Empire State Building) served as consulting architects. They wrote a newspaper article claiming that 40 Wall was actually the tallest, since it contained the world's highest usable floor. They pointed out that the observation deck of 40 Wall was nearly 100 feet (30 m) higher than the top floor of the Chrysler, whose surpassing spire was strictly ornamental and essentially inaccessible. Despite the protest, the Chrysler Building was generally accepted as the tallest building in the world for almost a year, until it was surpassed by the Empire State Building’s 1,250 feet (380 meters) in 1931. The Petronas Towers remain the tallest twin towers in the world. A major controversy erupted upon completion of the Petronas Towers in Kuala Lumpur, Malaysia in 1998. These twin towers, at 1,483 feet (452 meters), had a higher architectural height (spires, not antennas), but a lower absolute pinnacle height and a lower top occupied floor than the Willis Tower in Chicago. Counting buildings as structures with floors throughout, and with antenna masts excluded, the Willis was still considered the tallest at that time. Excluding their spires, which are 9 meters (30 feet) higher than the flat roof of Willis, the Petronas Towers are not taller than Willis. At their convention in Chicago, the Council on Tall Buildings and Urban Habitat (CTBUH) found the Willis Tower (without its antennas) to be the third-tallest building, and the Petronas Towers (with their spires) to be the world's two tallest buildings. Height to Architectural Top (including spires and pinnacles, but not antennas, masts or flagpoles). This measurement is the most widely used and is used to define the rankings of the 100 Tallest Buildings in the World. The height-to-roof criterion was discontinued because relatively few modern tall buildings possess flat rooftops, making this criterion difficult to determine and measure. The CTBUH has further clarified their definitions of building height, including specific criteria concerning subbasements and ground level entrances (height measured from lowest, significant, open-air, pedestrian entrance rather than from a previously undefined "main entrance"), building completion (must be topped out both structurally and architecturally, fully clad, and able to be occupied), condition of the highest occupied floor (must be continuously used by people living or working and be conditioned, thus including observation decks, but not mechanical floors) and other aspects of tall buildings. The height is measured from the level of the lowest, significant, open-air, pedestrian entrance. At the time, the Willis Tower held first place in the second and third categories, the Petronas Towers held the first category, and the original WTC north tower held the fourth (height to tip) category with its antenna. In 2000, however, a new antenna mast was placed on the Willis Tower, giving it the record in the fourth category. On April 20, 2004, the 101-storey Taipei 101 in Taipei, Taiwan, was completed, taking the world record for the first three categories. On July 21, 2007, it was announced that Burj Khalifa in Dubai, UAE, had surpassed Taipei 101. Since its completion in early 2010, Burj Khalifa leads in all categories (the first building to do so) with its spire height of 2,722 feet (830 meters). Before Burj Khalifa was completed, Willis Tower led in the height-to-tip category with 1,729 feet (527 meters) after its antenna was extended in 2000, making Willis Tower slightly taller height-to-tip than the WTC north tower's antenna that measured 1,728 feet (527 meters). After the September 11, 2001, attacks, the WTC became the world's tallest two buildings to be destroyed or demolished. They took that distinction from the Singer Building, which stood 612 feet (187 meters) tall until the late 1960s where One Liberty Plaza now stands right across Church Street from the WTC site. A different superlative for skyscrapers is their number of floors. The original World Trade Center set that record at 110 in the early 1970s, and this was not surpassed until the Burj Khalifa opened in 2010. Structures such as the CN Tower, the Ostankino Tower and the Oriental Pearl Tower are excluded from these categories because they are not "habitable buildings", which are defined as frame structures made with floors and walls throughout. The world's tallest freestanding structure on land is defined as the tallest self-supporting artificial structure that stands above ground. This definition is different from that of world's tallest building or world's tallest structure based on the percentage of the structure that is occupied and whether or not it is self-supporting or supported by exterior cables. Likewise, this definition does not count structures that are built underground or on the seabed, such as the Petronius Platform in the Gulf of Mexico. Visit world's tallest structure by category for a list of various other definitions. The tallest freestanding structure on land is the Burj Khalifa in Dubai, United Arab Emirates. The building surpassed the height of the previous record holder, the 553.3 m (1,815 ft) CN Tower in Toronto, Ontario, on September 12, 2007. It was completed in 2010, with final height of 829.8 m (2,722 ft). The following is a list of structures that have held the title as the tallest freestanding structure on land. c. 2610 BC 5 Meidum Pyramid in Egypt c. 2610 BC 93.5 307 29°23′17″N 31°09′25″E﻿ / ﻿29.38806°N 31.15694°E﻿ / 29.38806; 31.15694﻿ (Meidum Pyramid) Shortly after completion Meidum Pyramid collapsed due to bad design/instability and is now 65 m (213 ft). c. 2605 BC 5 Bent Pyramid in Egypt c. 2605 BC 101.1 332 29°47′25″N 31°12′33″E﻿ / ﻿29.79028°N 31.20917°E﻿ / 29.79028; 31.20917﻿ (Bent Pyramid) Angle of slope decreased during construction to avoid collapse. c. 2560 BC 3871 Great Pyramid of Giza in Egypt c. 2560 BC 146 481 29°58′44.93″N 31°08′3.09″E﻿ / ﻿29.9791472°N 31.1341917°E﻿ / 29.9791472; 31.1341917﻿ (Great Pyramid of Giza) By 1647, the Great Pyramid had eroded to a height of approximately 139 m (456 ft). 1569 4 Beauvais Cathedral in France 1225 - 1604 153 502 49°25′49″N 2°05′43″E﻿ / ﻿49.43028°N 2.09528°E﻿ / 49.43028; 2.09528﻿ (Beauvais Cathedral) Spire collapsed in 1573 (the cross was removed in 1572); today, the church stands at a height of 67.2 m (220.5 ft). 1573 94 (20+74) St. Mary's Church in Stralsund, Germany 1384–1478 151 495 54°18′36.01″N 13°5′14.81″E﻿ / ﻿54.3100028°N 13.0874472°E﻿ / 54.3100028; 13.0874472﻿ (St. Mary's church, Stralsund) The spire burnt down after a lightning strike in 1647. The current spire's height is 104 m (341 ft). 1647 227 Strasbourg Cathedral in France 1439 142 469 48°34′54.22″N 7°45′1.48″E﻿ / ﻿48.5817278°N 7.7504111°E﻿ / 48.5817278; 7.7504111﻿ (Strasbourg Cathedral) By 1647, the Great Pyramid had eroded to a height of approximately 139 m (456 ft) hence Strasbourg Cathedral was higher. 1884 5 Washington Monument in Washington D.C., United States 1884 169 555 38°53′22.08″N 77°2′6.89″W﻿ / ﻿38.8894667°N 77.0352472°W﻿ / 38.8894667; -77.0352472﻿ (Washington Monument) The world's tallest all-stone structure, as well as the tallest obelisk-form structure. 1889 41 Eiffel Tower in Paris, France 1887–1889 300 986 48°51′29.77″N 2°17′40.09″E﻿ / ﻿48.8582694°N 2.2944694°E﻿ / 48.8582694; 2.2944694﻿ (Eiffel Tower) First structure to exceed 300 metres in height. The addition of a telecommunications tower in the 1950s brought the overall height to 324 m (1,063 ft). 1931 36 Empire State Building in New York, United States 1930–1931 381 1,250 40°44′54.95″N 73°59′8.71″W﻿ / ﻿40.7485972°N 73.9857528°W﻿ / 40.7485972; -73.9857528﻿ (Empire State Building) First building with 100+ stories. The addition of a pinnacle and antennas later increased its overall height to 448.7 m (1,472 ft). This was subsequently lowered to 443.1 m (1,454 ft). 1967 8 Ostankino Tower in Moscow, Soviet Union 1963–1967 540 1,762 55°49′10.94″N 37°36′41.79″E﻿ / ﻿55.8197056°N 37.6116083°E﻿ / 55.8197056; 37.6116083﻿ (Ostankino Tower) Remains the tallest in Europe. Fire in 2000 led to extensive renovation. 2007 present Burj Khalifa in Dubai, United Arab Emirates 2004–2009 829.8 2,722 25°11′50.0″N 55°16′26.6″E﻿ / ﻿25.197222°N 55.274056°E﻿ / 25.197222; 55.274056﻿ (Burj Dubai) Holder of world's tallest freestanding structure. Topped out at 829.8 m (2,722 ft) in 2009.
Notable mentions include the Pharos (lighthouse) of Alexandria, built in the third century BC and estimated between 115–135 m (377–443 ft). It was the world's tallest non-pyramidal structure for many centuries. Another notable mention includes the Jetavanaramaya stupa in Anuradhapura, Sri Lanka, which was built in the third century, and was similarly tall at 122 m (400 ft). These were both the world's tallest or second-tallest non-pyramidal structure for over a thousand years. The tallest secular building between the collapse of the Pharos and the erection of the Washington Monument may have been the Torre del Mangia in Siena, which is 102 m (335 ft) tall, and was constructed in the first half of the fourteenth century, and the 97-metre-tall (318 ft) Torre degli Asinelli in Bologna, also Italy, built between 1109 and 1119. Timeline of development of world's highest observation deck since inauguration of Eiffel Tower. 1889 42 Eiffel Tower, Paris 1889 275 902 Two lower observation decks at 57 and 115 m (187 and 377 ft). 1931 42 Empire State Building, New York City 1931 369 1,250 On the 102nd floor - a second observation deck is located on the 86th floor at 320 m (1,050 ft). 1976 32 CN Tower, Toronto 1976 446.5 1,464.9 Two further observation decks at 342 and 346 m (1,122 and 1,135 ft). 2008 3 Shanghai World Financial Center, Shanghai 2008 474 1,555 Two further observation decks at 423 and 439 m (1,388 and 1,440 ft). 2011 3 Canton Tower, Guangzhou 2011 488 1,601 The rooftop outdoor observation deck opened in December 2011. There are also several other indoor observation decks in the tower, the highest at 433.2 m (1,421 ft). 2014 2 Burj Khalifa, Dubai 2010 555 1,821 Opened on October 15, 2014 on the 148th floor. There is another observation deck at 452.1 m (1,483 ft) on the 124th floor, which has been open since the building was opened to the public. 2016 present Shanghai Tower, Shanghai, China and Ping An Finance Centre (since 2017) 2015 562 1,841 Opened on July 1, 2016. Higher observation decks have existed on mountain tops or cliffs, rather than on tall structures. The Grand Canyon Skywalk, constructed in 2007, protrudes 21 m (70 ft) over the west rim of the Grand Canyon and is approximately 1,100 m (3,600 ft) above the Colorado River, making it the highest of these types of structures. As most of the tallest structures are guyed masts, here is a timeline of world's tallest guyed masts, since the beginning of radio technology. As many large guyed masts were destroyed at the end of World War II, the dates for the years between 1945 and 1950 may be incorrect. If Wusung Radio Tower survived World War II, it was the tallest guyed structure shortly after World War II. Towers include observation towers, monuments and other structures not generally considered to be "habitable buildings", they are meant for "regular access by humans, but not for living in or office work, and are self-supporting or freestanding, which means no guy-wires for support", meaning it excludes from this list of continuously habitable buildings and skyscrapers as well as radio and TV masts. Bridge towers or pylons, chimneys, transmission towers, and most large statues allow human access for maintenance, but not as part of their normal operation, and are therefore not considered to be towers. The Tokyo Skytree, completed in February 2012, is 634 m (2,080 ft), making it the tallest tower, and second-tallest freestanding structure in the world. Tokyo Tower held the record of being the tallest tower in the world from 1958 to 1967. In addition, it held the record of being the tallest structure in Japan from 1958 to 2011, when the Tokyo Skytree (the current tallest tower in the world) surpassed it. The following is a list of structures that have historically held the title as the tallest towers in the world. The structures (supported) list uses pinnacle height and includes architectural structures of any type that might use some external support constructions like cables and are fully built in air. Only the three tallest are listed, as more than fifty US TV masts have stated heights of 600–610 metres (1,970–2,000 ft). The structures (media supported) list uses pinnacle height and includes architectural structures of any type that are not totally built in the air but are using support from other, denser media like salt water. All structures greater than 500 metres (1,640 ft) are listed. The freestanding structures list uses pinnacle height and includes structures over 500 metres (1,640 ft) that do not use guy-wires or other external supports. This means truly free standing on its own or, in similar sense, non-supported structures. The building list uses architectural height (excluding antennas) and includes only buildings, defined as consisting of habitable floors. Both of these follow CTBUH guidelines. All supertall buildings (450 m and higher) are listed. Eight buildings appear on the freestanding structures category list with heights different from another category. This is due to the different measurement specifications of those lists. Only current heights and, where reasonable, target heights are listed. Historical heights of structures that no longer exist, for example, for having collapsed, are excluded. ^ a b "CTBUH Criteria for Defining and Measuring Tall Buildings". Council on Tall Buildings and Urban Habitat. Retrieved August 19, 2008. ^ "Burj Dubai all set for 09/09/09 soft opening". Emirates Business24/7. Retrieved January 17, 2009. ^ "Burj Dubai surpasses KVLY-TV mast to become the world's tallest man-made structure" (Press release). Emaar. Retrieved May 28, 2008. ^ ctbuh. "CTBUH Criteria for Defining and Measuring Tall Buildings". www.ctbuh.org. Retrieved 2018-11-09. ^ "Max Bögl installs record-breaking 246.5-metre turbine". ^ "Comansa Jie builds the world's highest cooling towers". Construcciones Metálicas COMANSA S.A. August 2012. Retrieved 29 August 2013. ^ "Tallest Unsupported Flagpole". Guinness Book of World Records. ^ "Tower West". Retrieved May 5, 2015. ^ McCord, Keith (May 23, 2012). "Tallest structure in West demolished". KSL-TV. Salt Lake City, UT. Retrieved September 29, 2012. ^ "Brazil builds giant Amazon observation tower". BBC News. ^ a b c d "History of Measuring Tall Buildings". Retrieved May 5, 2015. ^ Binders, George (August 2006). 101 of the World's Tallest Buildings. p. 102. ^ a b "Willis Tower, Chicago - SkyscraperPage.com". SkyscraperPage.com. Retrieved May 5, 2015. ^ "CTBUH Criteria for Defining and Measuring Tall Buildings". Retrieved May 5, 2015. ^ "CTBUH changes height criteria, Burj Khalifa height increases". Council on Tall Buildings and Urban Habitat. November 17, 2009. Retrieved November 18, 2009. ^ a b "CTBUH Changes Height Criteria". Retrieved May 5, 2015. ^ "CTBUH Criteria for Defining and Measuring Tall Buildings". Ctbuh.org. Retrieved 2018-09-20. ^ "Lincoln Cathedral". Retrieved May 5, 2015. ^ Kendrick, A. F. (1902). "2: The Central Tower". The Cathedral Church of Lincoln: A History and Description of its Fabric and a List of the Bishops. London: George Bell & Sons. p. 60. ISBN 978-1-178-03666-4. The tall spire of timber, covered with lead, which originally crowned this tower reached an altitude, it is said, of 525 feet; but this is doubtful. This spire was blown down during a tempest in January 1547–8. ^ "The Empire State Building". Wired New York. Retrieved December 23, 2007. ^ "Tokyo Sky Tree construction ends: World's tallest tower prepares to open". Cable News Network. 1 March 2012. Retrieved 1 March 2012. ^ Danielle Demetriou (1 March 2012). "Tokyo unveils world's tallest communications tower". The Daily Telegraph. Retrieved 1 March 2012. ^ "Tokyo Skytree website" (in Japanese). Tobu Railway Co., Ltd. & Tobu Tower Skytree Co., Ltd. Retrieved 2011-03-08. This page was last edited on 20 April 2019, at 06:45 (UTC).